A memorandum of understanding of all stakeholders was signed in May 2012 which included the changes the Task Force desired to implement in a new Diversion alternative. The Task Force aimed to curtail some of the general, across the board requirements for all participants and to shorten the program so that participants could complete the program within 90 days, 6 months, 9 months, and a year. Once completion requirements were agreed upon, Diversion Track I was formally launched in July 2012 at a luncheon at the Louisiana State Bar Association, attended by stakeholders from across the criminal justice and political community. This pilot program was designed to serve up to 50 arrestees. 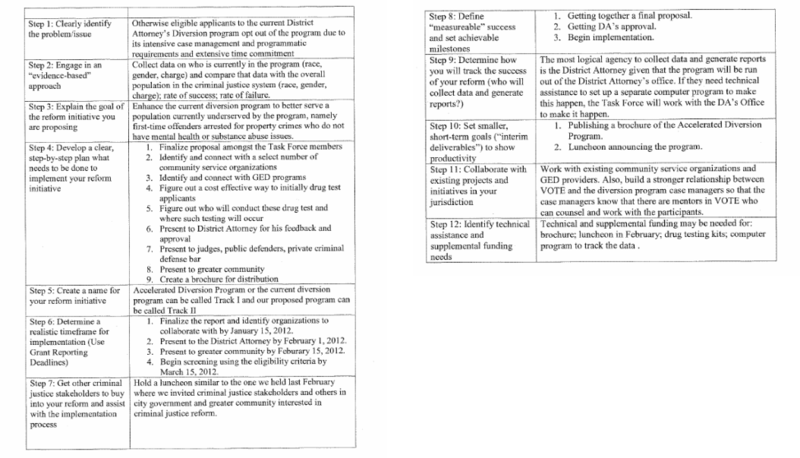 The Task Force allocated funds to off-set the cost of drug testing and applied for additional technical assistance to improve the client data tracking systems for Diversion Track 1 and 2. The Task Force eliminated the need for extensive treatment options by negotiating with the DA’s Office to extend programming for those arrested for crimes other than drug-related offenses. Task Force members and other stake holders participated in a variety of events/conferences in preparation for reform implementation and research. Some members of the Task Force attended the National Association of Pretrial Services Agencies (NAPSA) convention in October of 2011. Those representatives were Judge White of the Criminal District Court, Andree Mattix and Leon Cannizzaro of the DA’s Office, and Michael Bradley of OPD. Members of the Task Force presented progress on Diversion Track 1 at the National Pretrial Diversion Symposium.